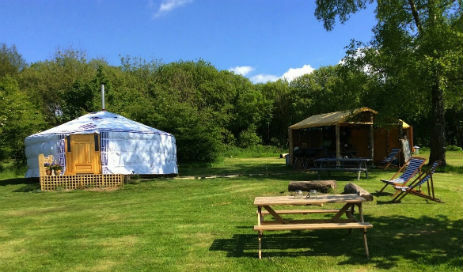 Cwm Ty Coed – Yurt, tipi and bell tent glamping set on our 30 acre smallholding in the rolling countryside of West Wales situated only three miles from the county town of Carmarthen. Once on site it is hard to imagine the proximity to such a bustling market town with its many restaurants, cafés and shops, and of course those flourishing markets for local produce. We provide comfortable and workable facilities for our guests; all with those little finishing touches which make such a difference. The smallholding is home to our lovely donkeys and ponies as well as a small flock of rare breed sheep who cheerfully perform their lawn mowing duties. Campers can help themselves to fresh eggs from the hens in the camping field and feed the miniature ducks who enjoy their pond in the centre of the field. All water if fenced for safety. 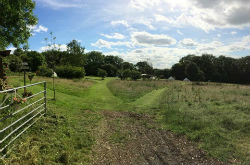 The eight camping pitches are situated in a large meadow surrounded by woodland. 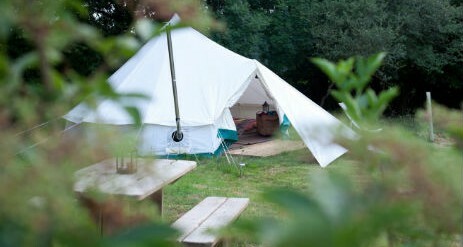 Each pitch has a private, well equipped camp kitchen and outdoor fire-pit. There is one double pitch for two bell tents, sharing a large kitchen, and is ideal for two families or a group of up to ten. Our largest and most comfortable accommodation. Comfortably sleeps six on two double and two single beds. An extra air bed can be used for as additional sleeping. 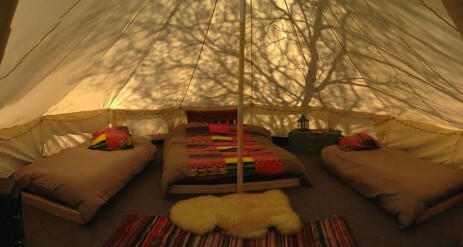 Traditional canvas tents, with lovely wooden fittings, are tastefully decorated and comfortably sleep up to five people in a double and two single beds, with extra air bed available. These are particularly airy and atmospheric, the added height providing a real feeling of space. 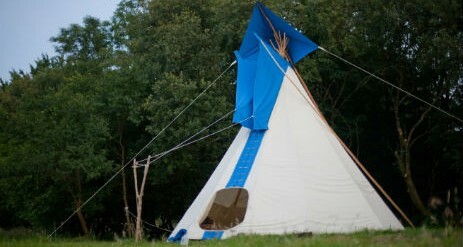 The tipis are comfortably furnished and sleep up to five in a double and two single beds with an additional airbed available if required. All accommodation is fully equipped with all beds, bedding and blankets. They each have either a wood burning stove or an open fire. Lanterns and solar lighting provide a lovely ambience. Each dwelling has a private, well equipped camp kitchen which is includes anything likely to be needed for camp cooking and dining. There is a double ring gas hob, cool box and a good selection of pans, utensils, crockery and cutlery. We provide barbecues and tools. A daily basket of logs is delivered each evening for the outdoor fire pits and the wood burning stoves. The camp kitchens are covered, have a wooden chip floor as well as a simple table and seating which enable our guests to enjoy meals under cover should the weather be wet. 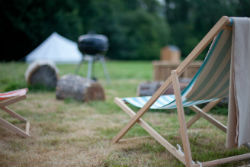 Each pitch has an outdoor fire pit for those lovely evenings under the stars. There is barbecue for each tent. Hammocks swing between trees near by and each pitch has its own picnic table. 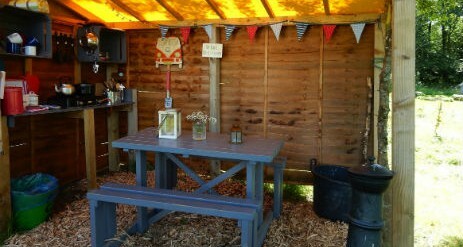 There are gas powered showers in the camping fields and we have compost toilets. We know that the quality of these facilities is very important to our guests and these are clean and attractively decorated. We are available on arrival to talk our guests through the simple instructions. Natural, filtered spring water is piped to each pitch. Set some way from the camping field there is a wooden cabin nestled amongst the trees which provides a comfortable space in which to relax should the weather be inclement; it is well supplied with books and board games, has a small kitchen area and table tennis. Occasionally, on request, we can arrange an outdoor ‘cinema’ in the woods for a truly memorable evening. There are acres of meadow and woodland at Cwm Ty Coed to be explored and dotted about the woods are various tree swings, there is even a zip wire (suitable for adults and children over 8 years old). Ecological cleaning products are always supplied for our guests. There is a recycling area on site and we encourage all possible waste to be composted. We use solar energy for most of the on-site lighting although there is mains electricity to the wooden cabin, for charging phones. We encourage camp fires in the designated fire pits. 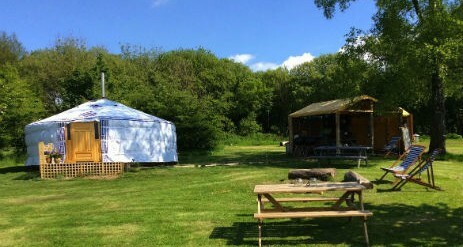 The camp site is well situated for many of the attractions of West Wales. The nearest coast is only five miles away and the fantastic Pembrey Country Park, with miles of sandy beach can be reached in fifteen minutes by car. To the east, the coast of the Gower is not far away and the many beaches of Pembrokeshire are an equal distance to the west. Llansteffan offers a spectacular coastal walk and you can be exploring its sandy coves within twenty minutes of leaving your tent. Brechfa Forest is very close by and offers stunning walks and mountain bike tracks. For those who prefer a more relaxed style of cycling there is the newly completed and award winning Millennium Coastal Path. We can even arrange cycle hire. The area is steeped in history and legend, after all Carmarthen is believed to be the oldest town in Wales and the fabled birth place of Merlin. Carmarthenshire boasts at least twelve castles. More recent history could draw you to the picturesque village of Laugharne and Dylan Thomas’ boat house with its evocative views across the estuary. For the adventurous spirit there are plenty of activities to be enjoyed including mountain biking, horse riding, coasteering, sailing, kayaking and seal watching on the West coast. 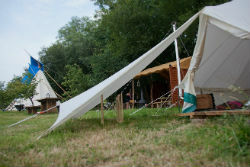 Yurt, Bell tents and tipis are priced for up to four; £20 supplement per night for additional adult and £10 for an additional child under 17 years. 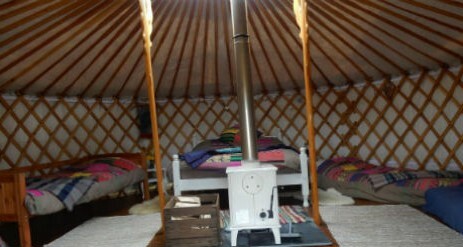 Bell tents and tipis can comfortably sleep up to 5 and the yurt can sleep 6/7. We welcome pets but please let us know before booking.